Since we’re in the mood to talk transitioning this week, I’d like to put in a plug for Eric Garcetti to continue to support and significantly expand one of the most important community efforts to reclaim public space for recreation. No, not CicLAvia (although it is indeed amazing). I’m referring to the Summer Night Lights (SNL) Program. The SNL program is based upon the “Summer of Success” violence prevention effort in Baldwin Village, first held at Jim Gilliam Park in 2003. When the Office of Gang Reduction and Youth Development’s (GRYD) was created in 2007 to reduce gang-related violent crime, SNL became one of the primary prevention components in that fight. The GRYD office determined that (among other things) the lack of safe and accessible public space, oppressive economic conditions, and crowded housing situations created significant stress within families. The effect on young people was particularly intense, they found, because there were few places outside the home that teens could go for recreation. This stress, they determined, could push kids into the streets where they were more likely to get involved in unhealthy activities or fall victim to crime or violence. Because parks often served as the gathering sites for many of those engaged in negative behaviors, the office believed that reclaiming those parks for the community could help change that dynamic and give young people healthier, positive alternatives. So, GRYD identified 12 communities where gang-related violence rates were seen to be as much as 4 times higher than that of the city average and targeted them for interventions. In the summer of 2008, this resulted in 8 parks playing host to sports activities, dance classes, film screenings, food give-aways, and other family-oriented fun activities four nights a week for two months. Since then, and with the help of private funding, the program has expanded significantly (although it will end Aug. 9th this year): 32 parks will host SNL events from 7 – 11 p.m., Wednesdays through Saturdays. The key claim in support of keeping the program alive is that there is an overall reduction in gang violence in the summer, namely a 55% reduction in shots fired, a 57% reduction in gang-related homicides, and a 45% reduction in the number of victims shot (according to 2010 figures). While I haven’t dug too deep into those figures just yet (fear not, it’s on my agenda for this summer as I head to SNL events in the housing projects), I tend to agree with the conclusions of an evaluation by the Advancement Project which urges caution in attributing too much of that success to the program. Instead, they found, while the SNL programs have likely contributed to reducing violence in some way, it is difficult to tease out specific impacts because the reductions mirror a larger city-wide trend that saw a drop-off in violence beginning around 2008 — the same time that the program was launched. That said, I still think the program is incredibly valuable and warrants greater investment, particularly in teen-focused programming. One of the interesting findings from the assessment was that people’s perceptions of park and community safety were significantly enhanced by the SNL program. During the summer, people reported feeling the parks were safer and that their quality of life had improved. Once the program had concluded in the fall, some of the gains in perceptions of safety were lost and people were not always sure whether or not the improvements to their quality of life carried over beyond the summer (see p. 18 of report). That bears out with what I hear from youth in some of the targeted GRYD areas who beg for SNL programming to be year ’round. Many complain they can’t access some of the parks after sunset during the school year and that transit back and forth to rec. centers can sometimes be treacherous because it gets dark so early. They are effectively left with nowhere to go. In South LA, some have said that to feel safe playing basketball, their only option was to head to USC. But even that option is not necessarily available to them anymore, thanks to USC’s new security measures. Many report feeling a lot less welcome on campus or have heard from friends that they will be asked to leave by Public Safety, so they don’t bother going in the first place. There are other important impacts SNL has that may not be easily captured by quantitative measures of violence but which can have a tremendous impact on people’s quality of life and, thus, are an argument for the expansion of the program. Most obvious on the list: jobs. The Summer Night Lights jobs are more highly coveted than you can begin to imagine. Many teens do piecemeal, informal work when they can during the school year (cleaning someone’s home, looking after kids, collecting recyclables, etc.). But when summer rolls around, they become desperate to find work that will help them support their families, save money for college, keep them out of trouble, and give them experience and leadership skills that will give them the confidence to finish high school or dive into the job market. Even gang members can be swayed and kept busy with jobs. Not that SNL pays quite as well as slinging dope or rock, of course, but a legitimate job can boost the self-esteem of youth that are struggling and make them feel capable and more optimistic about their ability to envision a future for themselves beyond gang-banging. Many coming from violent backgrounds do not necessarily expect to make it to their early 20s, so they don’t do a whole lot of thinking about the future. A job where they are entrusted with responsibility and able to contribute to their community can act as a catalyst for them to rethink self-destructive behaviors and begin to consider their potential. Unfortunately, jobs for youth are very few and far between right now. A social worker that does job placement in Watts said that there were only about 2000 city-sponsored jobs available this year. That’s an epically tiny number, considering gang membership alone is estimated to be somewhere in the 40,000s. Youth I’ve mentored who are not gang-affiliated have even been emailing me asking about jobs because they can’t find part-time work anywhere — not in fast-food joints, not at paid internships, not with local non-profits…nothing. An expanded Summer Night Lights program could help mitigate this situation, particularly if the program was able to focus on hiring and/or cultivating local youth as performers, artists, or dance teachers to work with younger kids. One of the criticisms of the program I have heard from residents in GRYD zones is that the performers or teachers brought in to run cultural programming at SNL are not from the community. It hurts the relationship between the community and the city because the community begins to question if the program is just paying lip-service to claims to be serving the area. In Crenshaw, for example, people openly questioned why outside drummers had been brought in to prior SNL events when drumming is a staple of the artwalk in Leimert and there are numerous drum teachers and classes in the area. Why not take the time to cultivate the talent and inject resources into the community, a slighted artist wanted to know. That approach would be more likely to have the lasting impact that the SNL program was going for and would attract more young people to the event, promoting safety and building community in the process. If you visit an SNL event, depending on the site, you may or may not see too many teens and/or local artists there. In other words, the very kids that the program was intended to reach out to and give alternative outlets to don’t always seem to be the ones participating in the events. 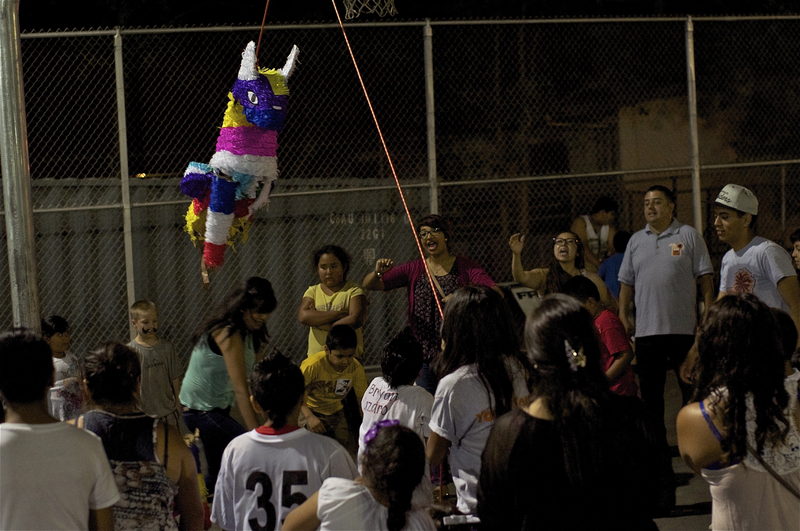 Except for the youth basketball game that was part of the SNL programming at the Lou Costello Jr. Recreation Center in Boyle Heights Wednesday night, for example, it was mainly kids under 12 and their families. Don’t get me wrong — the kids had a great time whacking away at a piñata, singing and dancing, playing on the playground equipment, and chowing down on the food cooked by SNL staff. But the extent to which direct, tangible, and measurable gang-violence reduction was occurring appeared questionable. Which brings me to my second argument for the expansion of SNL with a greater focus on teens: giving teens more long-term structured activities can build community cohesion, make neighborhoods sites of recreation, and, if you still need to think about quantifying impacts, prevent violence and lower law enforcement and health-care costs down the road. Kids that grow up playing and having fun together can avoid becoming future rivals. But, unfortunately, in troubled communities, that doesn’t always happen naturally. While it might seem strange to hear that childhood friends would one day be at risk for shooting at each other, it isn’t as unusual as you might think. Gangs have strict codes and rules. If two friends join rival gangs, they both do so with the understanding that, if one catches the other alone in his territory, it’s often going to end very badly for one of them. Sometimes it’s a beat down; occasionally it is more serious. It’s not a personal thing, some have explained. It’s just the rules. Where, later in life, older gang members are able to navigate and bend the rules a bit so they aren’t fighting everyone all the time, younger members have to prove themselves and thus often see the rules as rigid and as trumping the personal relationships they have. That means that, without early intervention, it becomes very hard to instill ideas of community and “we are all in this together” to kids that take that path. In fact, “community” often appears to be a foreign or distant concept to many at-risk youth I’ve interviewed — they like the idea of it but don’t know what it looks in action. Thus, offering teens regular, alternative, positive, and structured activities that encourage teamwork, sportsmanship, honor and respect, a sense of belonging, and mutual assistance could serve to keep kids from being indoctrinated into that negative mindset in the first place. Even for those that remain in gangs, knowing an alternative is out there is important. That alternative, offered within settings like SNL, where the wider community is enjoying an evening socializing with neighbors and sometimes with the police officers (not all officers take the opportunity to shmooze the community), could help youth come to associate positive things with the notion of community and value having safe spaces where everyone can come together, regardless of affiliation. By bringing people together, SNL events can also help people change their perceptions of each other. Like in the case of Javier Torres, a Boyle Heights youth who had a troubled childhood but used SNL as a way to explore his love of dance and try his hand at teaching little kids moves. As recounted here, police officers who had previously considered him a troublemaker were able to see him differently, even shocking him and taking him out to lunch one day to let him know they were proud of the direction he was moving in. Their simple gesture affected him deeply and helped convince him that he could be an asset to the neighborhood. Young police cadets at the SNL event in Boyle Heights on Wednesday (at right) were also out to change people’s perceptions of the police and the role they can play in the community. They all understood how police were seen, they said, and even had to deal with people seeing them as having joined up with the enemy on occasion. But they had nothing but praise for the program, saying it had given them discipline and opened them up to many opportunities they would never have had otherwise. It’s so different to see the LAPD from the inside, they said. They no longer feared the police, but understood them as people. Above all, some said, they really enjoyed that participating in the program gave them the opportunity to serve at community events like SNL, interact with people in positive ways, and be a part of making their neighborhoods safer places. More opportunities for youth to gain people skills and leadership skills while contributing to their neighborhoods are paramount to helping a sense of community grow and flourish. It is fantastic to know that there will be more CicLAvias to come and that the city understands the value of creating public space where people can come together as one in the name of recreation and community. I hope that Eric Garcetti is able to see that the SNL programs serve many of the same functions as a CicLAvia, but are even more essential to the GRYD communities, given the contested nature of public space and the extent to which access to it can be governed by negative dynamics. It seems that he might — when asked about his feeling on SNL in a Reddit forum held during the mayoral race, Garcetti reiterated his support for the program and of a similar program he had created after a shooting near a park in his district years earlier. He went on to say that he hoped to explore ways to make it a year-round event. Here’s hoping that his support is sincere and that it can be both be extended beyond a summer program and tailored even more specifically to target teens. There are so few places for them to go, so few resources to keep them occupied, and so few employment opportunities. Truly investing in teens and in opportunities for them to serve their communities is one of the most important (and cost-effective) steps we could take toward building a safer and more harmonious city over the long term. Yes, that would be great. I guess the fear might be that in running it all year round, it starts to become indistinguishable from the general framework of youth, recreation, gang intervention, etc. programs, most of which are incredibly valuable, and all of which are constantly struggling for funds. But I think it has been proven time and time again that giving at-risk youth positive alternatives works wonders, and should be expanded whenever and wherever possible. True–the SNL programs can be a real drain from other intervention activities and have been cited as stretching GRYD workers too thin. So focusing the programs better during the off-season might be the way to go. The hope had been to expand the program to 50 parks by 2013 — that obviously didn’t happen, and I believe they are cutting programming short be a week or two. So, clearly, funding came up short somewhere along the way. But these kinds of things are so necessary… there really aren’t movie theaters, bowling alleys, and other sites of recreation for kids beyond rec centers and parks, really. So making these accessible in ways that benefit teens as much as possible should be a priority. The easiest way of reducing the cost would be to partner with local residents and organizations to provide the programming. I know parents, CBOs, and residents across the city and county that would jump at the opportunity to provide programming at either SNL & PAD. Unfortunately, both the city and the county aren’t very good at working with people that they don’t control. It’s easier, from both a liability and logistical standpoint, to do everything themselves. Until local governments in LA find a way to manage and protect volunteer programming, programs like SNL will always be either under-funded or on the chopping block. That’s a great point, and gets to what people seemed to be complaining about with regard to the cultural programming coming from outside the community. You just said it more clearly than I did. Thanks! Support the Mar Vista Great Streets project at a critical neighborhood council meeting tomorrow night. Other events this week include Toxic Tour leader training, Baldwin Hills Crenshaw Plaza redevelopment, bus service changes, Summer Train Fest and more.